The Avg. Group Discount is 3.6%! The Brooklyn Hilton is one of the best options in the neighborhood. The Marriott is often overpriced and full due to conferences. So we went with the Hilton and this hotel was the best option for our needs. We needed a place in Brooklyn near our venue, the Brooklyn Historical Society and our rehearsal dinner location down the street. (We also booked a block at the Even hotel, but only a few guests stayed there.) We booked up over 30 rooms, I booked a junior suite and we booked a brunch using their hotel catering. Event team: Zachary and his team worked hard to provide us all the info we needed. They were attentive and responded to any nudges or questions within 24 48 hrs which was better than many of our wedding vendors. I also liked Zachary as he seemed more earnest and dedicated to our needs than other vendors. His partner Atiyya was also very on top of things. The person covering the brunch on Sunday and the catering team were also very good. They helped us hook up a projector and a laptop so we could screen photos from the wedding during brunch. The brunch itself was yummy and guests left Sunday happy and well fed. Positives: The hotel is small enough for out of towners to feel comfortable and in a nice area that is easy to get to places in the area like the Botanical Garden, The Brooklyn Museum of Art, promenade and other areas. The rooms and hotel are fairly new so it has a new, clean, spotless feel to it. The best thing was the suite they gave us for getting ready. They initially showed us a very small suite as it was the only one clean when we visited, but we ended up getting a really large suite for our needs with a very large "living" area with natural light that was great for getting ready. The bathroom was also big for this purpose. It was great and we were happy with it. (Zachary also made a video of the suite which he emailed us to in advance which was going the extra mile.) Lots of room for makeup artists who were working on multiple groups of wedding party etc. Other notes: It is a newer hotel, so it seems like they are just getting their stride on events and handling groups of guests. The extras were straightforward we received a cheese and fruit plate and bottle of champagne the day of the wedding. (This seems similar to other hotels in NYC.) As a boutique hotel, it lacked some things other hotels have available. For example, when we got there Friday all bogged down with bags and wedding dress, there was no doorman and we bussed our own stuff with one of the carts to our own room's door. Also, the front desk staff were not always aware of our wedding at the hotel and the staff seemed kind of new in some cases, so any requests had to be first referred to the events folks. But once events folks were alerted and got wind of a need, the events folks did follow up quickly. Also the concierge was responsive which was good. We needed tape the day of for something and it was brought up quickly. They handled our gift bags well as our guests all got their bags. (However they charge for doing this.) Hotel itself: It is very dark in the hallways, giving the hotel a kind of moody feel which makes it seem smaller than it is. We liked the overall design of the place referencing old Brooklyn maps and area history. The restaurant at the hotel is very good and the service at the bar and restaurant was good. Overall the service and the attention to our guests' needs was positive. Overall we were happy with the hotel. The wedding weekend itself was great, our guests have not complained about the hotel at all (that we have heard) and overall, the hotel was perfect for our needs. 10-Apr-2019 Verified Review, stayed from Fri Apr 05 to Sun Apr 07 2019 at a $179.00 group rate. Stay in the heart of Downtown Brooklyn at the new Hilton Brooklyn New York. Our modern boutique style hotel provides a relaxing getaway yet keeps you close to all the city action. Feel confident that our knowledgeable and bi-lingual team members will provide you the utmost service and comfort you expect from your home away from home.Stay productive at the large workstation with ergonomic chair and WiFi with extensive bandwidth. Store valuables in the in-room safe. Watch your favorite shows on the 40-inch HDTV. You'll appreciate the coffeemaker, mini-refrigerator and modern décor.Walk to the lobby to our Brooklyn Yards restaurant and bar. If you're in a hurry, make a purchase at the Grab and Go section of the lobby for a healthy snack anytime. Get in a workout at the fitness center with treadmills, elliptical trainers, recumbent bikes and free weights. Stroll through the retail space around the perimeter of the hotel or catch a taxi to see the various attractions throughout the city. Located close to the Barclays Center, Brooklyn Bridge and downtown Manhattan, you're sure to have a full schedule of fun.Plan your next event in our 5,000 sq. ft. of flexible space for up to 140 people. Our space is perfect for a small wedding reception, corporate trainings and social gatherings. Internet is $14.95 for 24 hours, unless you're a HHonoros member, then it's complimentary. 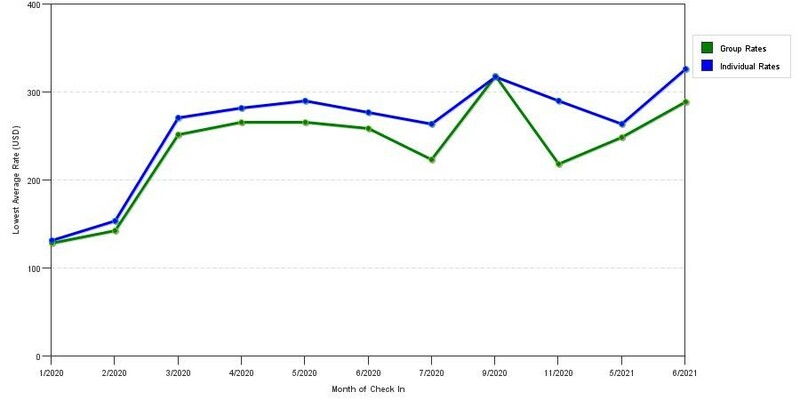 The graph above is averages of room rates for both our group prices and the lowest online individual rates our rate checker could find at the time the group/meeting offer was submitted. The best group/meeting discount shown is 17.8% in July 2017 and the highest average individual rate is $357 in the month of October 2018. This chart will show past seasonality and also project future months. If you are flexible with dates, you may want to consider staying at Hilton Brooklyn New York in a month when rates are lower. Below are the meeting, banquet, conference and event spaces at Hilton Brooklyn New York. Feel free to use the Hilton Brooklyn New York meeting space capacities chart below to help in your event planning. Hotel Planner specializes in Brooklyn event planning for sleeping rooms and meeting space for corporate events, weddings, parties, conventions, negotiated rates and trade shows. 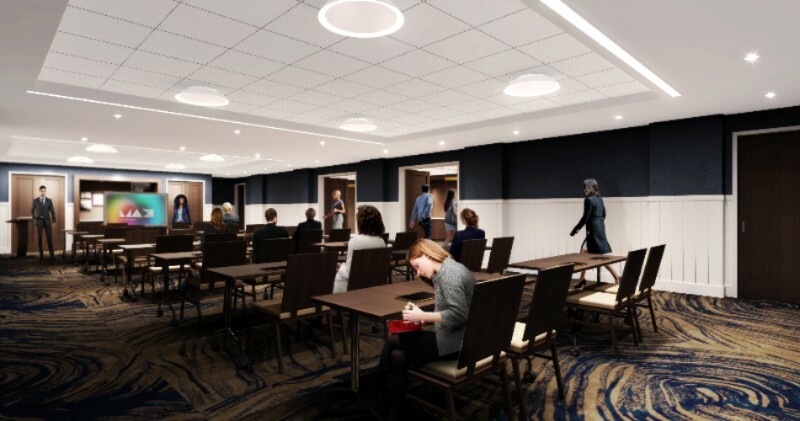 Centrally located within Downtown Brooklyn, our Hilton meetings venue will transform your meeting or event into a creative and innovative gathering. Hilton Brooklyn New York hotel is the ideal fit for meetings or events from 10 to 140 people. With unique and intimate meeting spaces, audio visual equipment capabilities and a dedicated event planning team, we provide the tools you need to plan a seamless and enriching meeting or event. 31 x 28 x 10 Ft. Concessions are available based off potential revenue generated. Centrally located within Downtown Brooklyn, our Hilton meetings venue will transform your meeting or event into a creative and innovative gathering. Hilton Brooklyn New York hotel is the ideal fit for meetings or events from 10 to 125 people. With unique and intimate meeting spaces, audio visual equipment capabilities and a dedicated event planning team, we provide the tools you need to plan a seamless and enriching meeting or event. 58 x 30 x 10 Ft.
Our Executive Lounge has the flexibility to morph into an event space that is capable of accommodating receptions only. Only available on Saturdays and Sundays.